Freecharge ILOVEFC Recharge Coupon Code Loot Offer, Freecharge New All Users Free Recharge Offer Coupon, Free Rs.50 Cashback on Rs.20 Recharge (5 Times) Freecharge Festive Cashback Offer – Once again Free Recharge offer is back again for all user this time. You already know Freecharge is always offering full 100% cashback offer on recharge, New User Recharge offer and many more offer for own users. 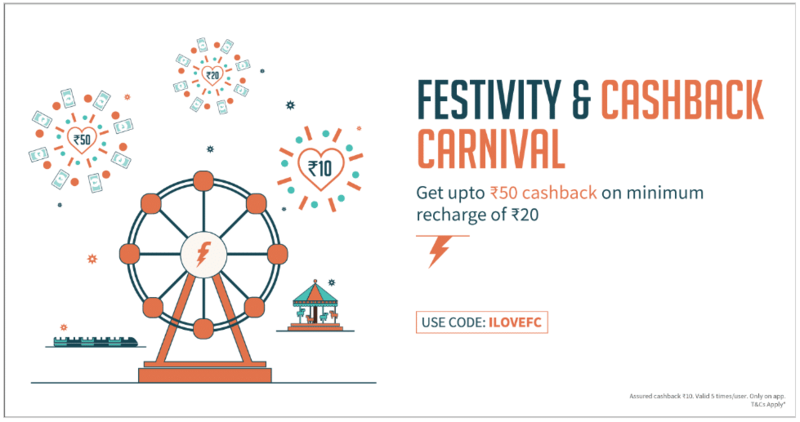 Today Freecharge present Festivity & Cashback Carnival Offer Loot. You will get Flat Rs.50 Cashbakc on Recharge of Rs.20 or more using special Freecharge coupon (All Users, 5 Times). This offer is valid for all users which is just amazing. In this offer you will get cashback upto Rs.50 on Recharge of Rs.20. Assured cashback amount is Rs.10. One of the best thing is that you can use this offer 5 Times in per account, also you can use Freecharge cashback balance (FC Balance) for recharge. So now the season of Free Recharge of, just Recharge your number form Freecharge 5 Times & get Upto 250% cashback every time. Apply Promo code – ILOVEFC to get Upto 250% Cashback. Pay the amount via Credit/Debit card/FC Balance. Finally you will get Free 250% cashback upto Rs.50 in your account. You can use this offer 5 times. Enjoy the loot recharge offer.